Daily Profits Review (dailyprofits.cc) - A Scam Or $2,400 Today?! Hello my friend to this Daily Profits Review! You are probably wondering if this guy who calls himself “Gary Jenkins” has really discovered some kind of a loophole that makes him tap into a trillion dollar industry and make millions of dollars a year working only few hours a day. He even claims that he made over $3 Millions during the last year and he shares a screenshot for what is supposed to be his bank account. And all of that thanks to this loophole that he discovered and that he’s willing to share it with you now. And I know how overwhelming it feels to hear such claims and to want to give it a try, it might be true. But I also know that you felt that there’s something unrealistic about these claims, and that’s why you started looking for Daily Profits Reviews in order to know what all of this is about. I will show you below the truth about the claims you heard in the sales video on the dailyprofits.cc website, and I will show you the RED FLAGS I found in the video and on the sales page of the Daily Profits system from Gary Jenkins, which make me not recommend his program. First Alternative: The best training program on the same method that is taught in the Daily Profits program, but from someone who is well-known and 100% legit. Second Alternative: The best training on a different method from the one that is taught in the Daily Profits program, but it is more newbie-friendly method and requires a lower investment. 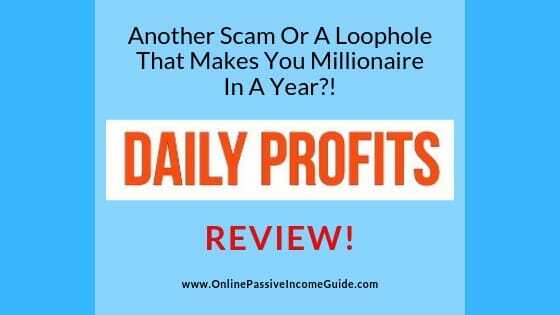 Daily Profits is a program that is supposed to teach you about a “Secret Loophole” that will allow you make millions of dollars a year from a Trillion dollar industry. The guy who speaks in the video and calls himself “Gary Jenkins” claims that he learned this method by trial and error, and that he discovered a loophole that other gurus were not aware of, which allowed him to triple his earnings. “Gary” doesn’t talk about what this method is, and what the loophole that he discovered is, but he promises to teach you if you join his program. But form the video alone, I knew what his program is all about, and I will explain it in the next section. How Does Daily Profits Work? Daily Profits works by letting you in for the low payment of the $7 in order to give you a very generic training about dropshipping that you can probably find better elsewhere for free, and then, blast you with upsells for more than $400 in order to teach you the advanced “secrets” and help you “boost your sales”. From the screenshot of the weekly income, it is clear that the method that is taught in the Daily Profits program is Dropshipping. It is an e-commerce model that allows you, the dropshipper/retailer, to show products that you still don’t own on your store for the price you decide and sell them to others, and when you get paid from a customer, you then go and pay the original merchant their own price and the cost of shipping, and you tell them to ship the product directly to the customer without you touching anything. And this is a great method of making money online. But the problem is that it is not as they describe it in the Daily Profits program. You don’t start by making $2,400/day on day one with dropshipping or with any other method of making money online. And more important, even when you make $2,400 a day, that’s not the profit. That’s the sales volume. Cost of the products to the original merchant. Cost of ads on Facebook and other platforms. Cost of the returns and refunds. Cost of the platform where you build your online store. Cost of the assistants you will hire in order to help you do the several tasks, especially when you have a big volume in sales. And depending on your pricing strategy, your advertising campaigns, your efficiency, your refund rate and some other factors, you might not be even profiting! You might make sales in $10,000 but you might spend more than that money on the paid ads alone if you don’t know what you are doing! “Gary” tells you that you only need $7 to start with his program, but as I mentioned earlier, you will be offered later to purchase upsells for up to $400 or more, and I’m still not confident that you will get a suitable training for the income you would like to generate. While for less than this cost, you can get the best training in the dropshipping industry if you go to the last section of this Daily Profits Review below. You still need to invest at least $1,000-$2,000 in advance on the paid ads in order to find a product that sells well and makes you profit, and they don’t tell you that in the video on the Daily Profits website! The cost of Daily Profits is $7 for the front end of the program, which will provide you with some training that won’t be enough to make the money they mention in the sales video, and probably it won’t help you make any money at all. This is only a low cost in order to convince you get it, and then, blast you with upsells for more than $400 to purchase a more “advanced training” that I also don’t think it will help you make the money mentioned in the video. In addition to that, you will need at least $1,000-$2,000 in advance in order to spend on the Facebook ads before you expect to become profitable. The good thing though, is that they offer a 60-days money back guarantee if you join it through this link. But I don’t recommend wasting your time anyway. If you want to learn this method, then check my recommended alternative in the last section below. It is about a legitimate method of making money online, dropshipping. The front end cost is low. It offers a money back guarantee. You will need it after you discover the lies. The guys you saw in video are paid actors that you can hire form Fiverr.com in order to record what you ask them to record for you. If Daily Profits was going to really deliver the mentioned claims and help you make money with dropshipping, then why don’t they bring real testimonials from real successful students instead of paying actors to record fake testimonials. I think this is a sufficient reason not to trust these guys, but let’s continue. 2 – Who Is Gary Jenkins? The guy who speaks in the video doesn’t show himself, and if you google his name, you might not find someone relevant with this name. How do you trust someone who is afraid to share his face if this was his real name?! When I first here the name “Gary Jenkins”, I remembered another program with a similar name of the founder. I dug deeper into my previous reviews, and I found that the “founder” of another similar program that I exposed in my Silk Road Effect Review has a similar name, “Steven Jenkins”. And even the bank statement you saw in the beginning of this review is similar to the one that is shared in the other program! And they both talk about dropshipping. Some people who sell online courses that don’t really deliver, go and create other courses on new websites and with new names of “founders” because they know that no one will trust them anymore. 4 – Another Secret Loophole! Run away from any program that tells you that there’s some “secret loophole, magic trick, push button, …etc.” that can make you money on autopilot or working so little. Of course there are some best practices and tools that can save you lots of time and effort, but there are no loopholes that no one else knows about that would allow you triple your income. They tell you that you get everything if you pay the price on the sales page, which is $7. As I explained earlier, there are upsells for more than $400. And you still need to pay for the tools, and you need to invest at least $1,000-$2,000 in paid ads in advance before you become profitable. If you want to get the best training on dropshipping for a price that is less than the $400 that you will pay for the Daily Profits program, then go to the last section of this review for my recommended alternative. There’s always a “limited number of spots” available with this kind of programs, and if you come in next month, you will see the same crap. I don’t like this tactic as it is usually used to trick people into buying a program without thinking or looking for reviews. As I mentioned earlier, “Gary” shares screenshots of sales volume and tells you that these are profits, but that’s a LIE. You still need to pay for the merchant to cover the cost of the product and shipping, you need to pay for the paid ads, the platform where you build and host your online store, the transaction fees, the assistants cost, …etc. And as I explained earlier, you might end up losing money in case that you are not good at the paid ads. This tactic is often used by the founders of these programs in order to convince people of joining them thinking that these are all profits, and it was used with many other programs such as the one I exposed in my Bank Ramp Review. 8 – Where Are The Important Pages? How do you make sure that your information will be handled properly, and that they will not blast your inbox with promotions or share your email with others. Who Is Daily Profits For? For “Gary Jenkins” to make money of you, and for anyone who wants to get disappointed. There’s no way to get support on the home page of the Daily Profits website. I’m not sure what is the case inside the members’ area. And since the program is still new, there’s not enough feedback about it. Conclusion – Is Daily Profits A Scam Or Legit? Daily Profits is not a scam since you actually get something in exchange of the money, even if it was a general and basic training or guide. However, just because you get something in return of the money you pay, it doesn’t mean that you have to purchase the program, as you will end up with a disappointment after you waste your time on a program that won’t make you the mentioned income claims. However, you still can make money online, and I still encourage you to learn how to make money with one of the many available methods. But I want you to start with the right mindset and learn from a legit person who doesn’t hid himself behind fake names. Is There A 100% LEGIT Alternative To The Daily Profits Course? The first alternative is the best training program on the same method of making money online, dropshipping. 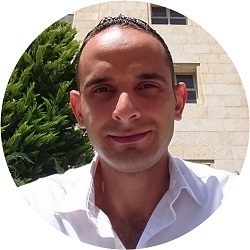 This alternative training program I’m recommending is provided by someone who is 100% legit and well-known mentor, and someone who has already taught thousands of students, of whom many have made success after consistently applying what he teaches them. My recommended alternative to the Daily Profits training program is The eCom Elites Training Course by Franklin Hatchett. Frank is a genuine person and teacher who is well-known to deliver. And if even though the cost of Frank’s course is higher than the cost of the front end of the Daily Profits, but remember that what you get in the Daily Profits front end will not be sufficient to really make money with dropshipping in the first place. And remember that there are still upsells for more than $400 with the Daily Profits program, while Frank’s course costs much less. And still, I don’t believe it will deliver the desired results. While if you join Frank Hatchett’s program, you will get one of the most comprehensive and updated training courses on dropshipping. In fact, eCom Elites is extremely under-priced when compared to other programs, especially with the huge value you will get with it. I have already reviewed some other programs that cost up to $997, and Frank Hatchett’s training is way better. This is the place to go to if you want to really be successful in dropshipping with Shopify. As I explained earlier, dropshipping is a legitimate way of making money online, but there are many reasons that it might not be suitable for everyone. For example, in addition to the cost of the training course you need to join, you need to invest at least $1,000-$2,000 in the PAID Facebook ads in order to get visitors your online store and test many products before you find one that sells well and start making profit. Research and test new products continuously. Monitor the FB ads campaigns regularly, which is a stressful and critical task by itself. Pay the merchant & send them the customers’ addresses. Provide customer support and reply to the emails. Deal with returns and refunds. Manage your team of assistants when you scale your business. And these activities together will require you to spend long hours every single day, and that’s ok. That’s the case with every kind of online or offline business. And if you can afford the additional cost of $1k-$2k on the paid ads, and if you can manage the stress that comes from dealing with the paid ads and from providing customer support, then you can go ahead with the dropshipping model through my recommended alternative mentioned earlier. But if you don’t have this additional money to invest in ads, or in case that you don’t think you can handle the stress from monitoring the Facebook ads and doing the customer support, then I would like to tell you about a different method from dropshipping, which is a more newbie-friendly one. This method, still requires you to put the time and consistent effort for not a short period of time before you become successful and generate a consistent income with it. But at least, with this method, you don’t have to handle the customer support by yourself, and you don’t have to deal with stress from the paid ads in order to get traffic to your online business since you will be relying mainly on the FREE organic traffic from Google and other search engines. And this method is more newbie-friendly than dropshipping, and it requires a lower investment, and therefore, it is associated with lower levels of stress and risk. So, if you want to know what this method is, how it works and why I consider it to be the best method of making money online, then you can get my FREE Ultimate Make Money Online Guide in order to learn about it. And in this guide, you will learn about the same place where I personally learned this great method of making money online, which is the same platform that will provide you with the all the necessary detailed step-by-step training, tools and support all at one place for NO Extra Cost. Even better, this platform offers a Starter Membership so that you can try it for FREE before you risk any money! No Credit Card required, 100% Risk Free! If you still want to learn and apply the dropshipping method and you have the additional money to invest in the paid ads, then click here to join the best training on dropshipping! Go now and get one of the two alternatives I offered you above and stop wasting your time and money on the low quality programs that don’t deliver with their “Secret Loopholes & Push Buttons”.